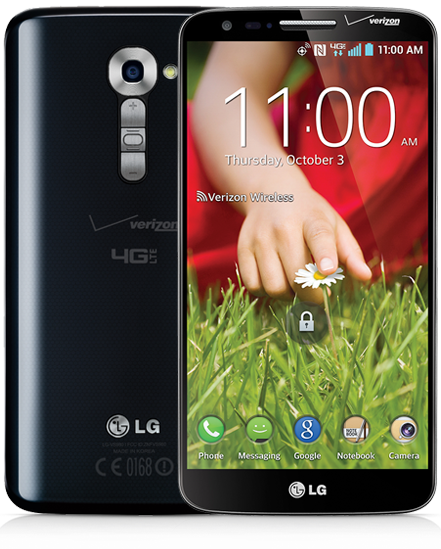 Verizon announced the official launch date of the LG G2 on its network this morning, scheduling its release for next Thursday, September 12. The device will be priced at $199.99 on contract, making the G2 a big contender for those considering the Galaxy S4, Moto X or the newly-unveiled Galaxy Note 3. The G2 features a 5.2″ 1080p display, 13MP back-facing camera with OIS technology, a Snapdragon 800 processor coupled with 2GB of RAM and a very unique button configuration gracing its backside. It is every bit of a top tier device for 2013. And for all of you T-Mobile users, the G2 has been confirmed to launch on its network September 18 online through T-Mobile.com. The device should hit retail stores nationwide starting September 25. As for T-Mo’s pricing, they have it listed at $99 down, with 24 monthly payments of $21.